The day before we were due to leave Danau Girang Field Centre in Borneo, and after a week of searching high and low for one, we found this beautiful lantern bug. We came across it on the buttress roots of a tree near the jetty at the field centre. This is where Tom had seen them in the past. Over the next hour, it slowly moved up the trunk of the tree until it was out of sight. Lantern bugs are part of the order, Hemiptera (the true bugs). This order contains other insects such as shield bugs, cicadas, and aphids which all share a common arrangement of sucking mouthparts. If you then break the order down into their families, lantern bugs are in the family, Fulgoridae. This is a large group of insects containing over 125 genera worldwide. They are especially abundant and diverse in the tropics. The first time we saw a lantern bug was on an episode of David Attenborough’s, Life in the Undergrowth. 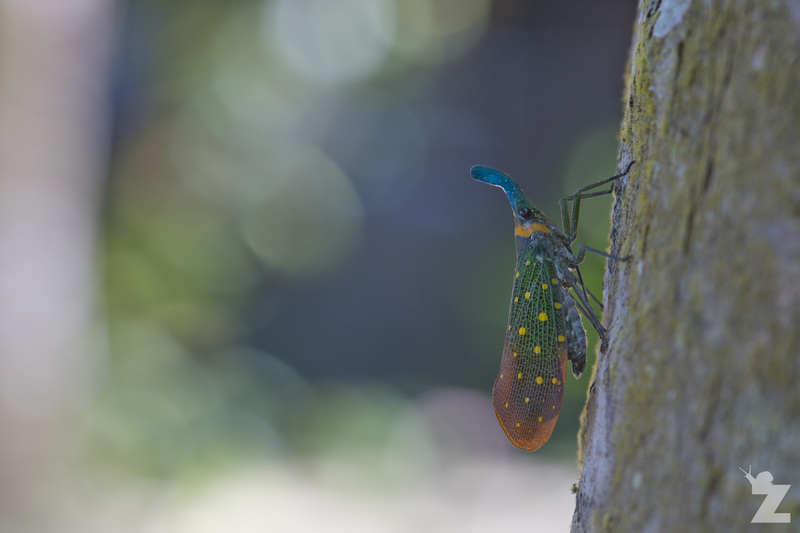 The clip showed a lantern bug feeding on the trunk of a tree at night. They feed by drilling a hole into the bark with their proboscis and sucking out the sap. This sap contains a small amount of protein which they want. It also contains a lot of sugar, most of which they don’t want. They get rid of the excess sugar by squirting it out the end of their abdomen and away from the tree like a miniature gun. This ensures that any ants which might attack the lantern bug are not attracted to its location. It is quite a sight to see. 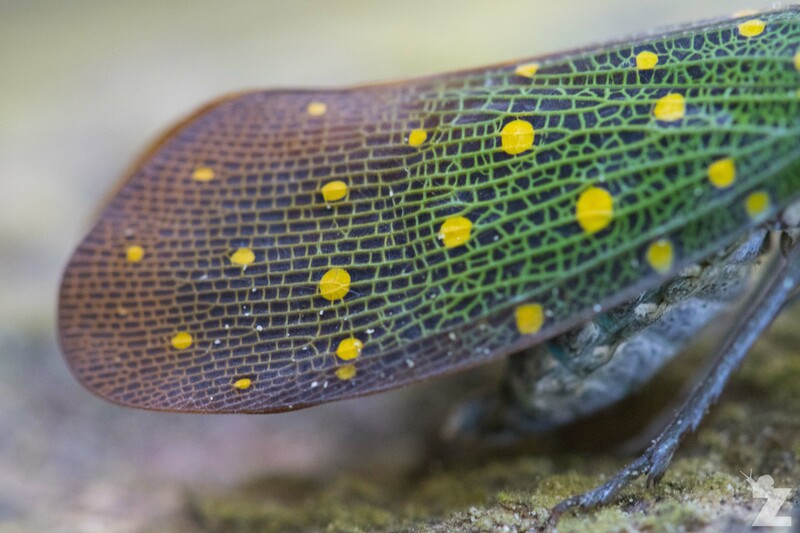 From the green-through-orange venation in its wings to its painted yellow polka-dots, this lantern bug’s patterning and colouration is like a work of art. It’s snout is a real eye-catcher. 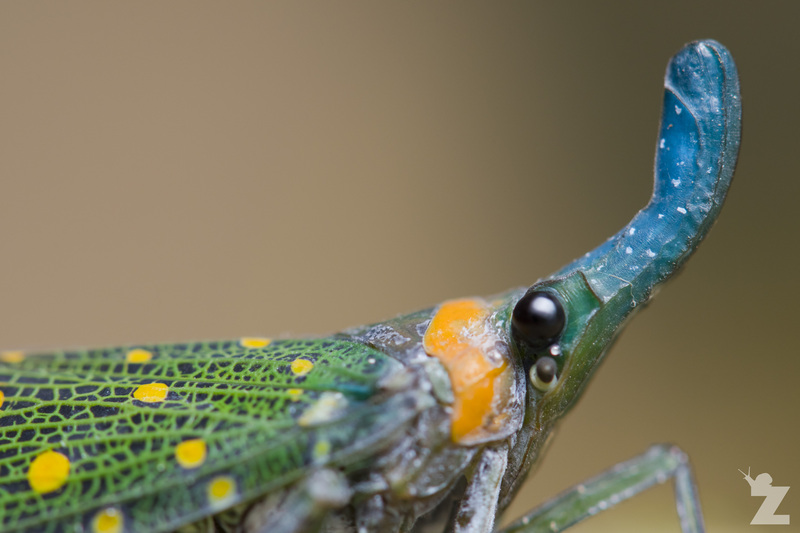 In fact, this snout is how lantern bugs originally got their name as people once thought it was luminous at night! Alas, it is not. How lucky we were to have the chance to see it. We can’t wait to photograph some other lantern bug species the next opportunity we get. 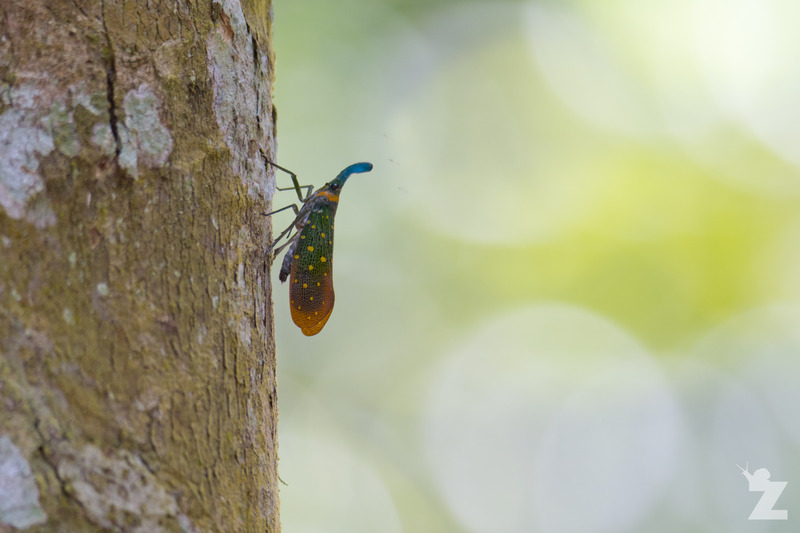 Click here to check out a post from the blog, Lost Borneo, to see another species of lantern bug that they photographed in Gunung Mulu National Park, Borneo. What an amazing little creature, and what a clever idea for getting rid of excess sugar! Thank you for your comment. 🙂 It’s gorgeous, isn’t it?! 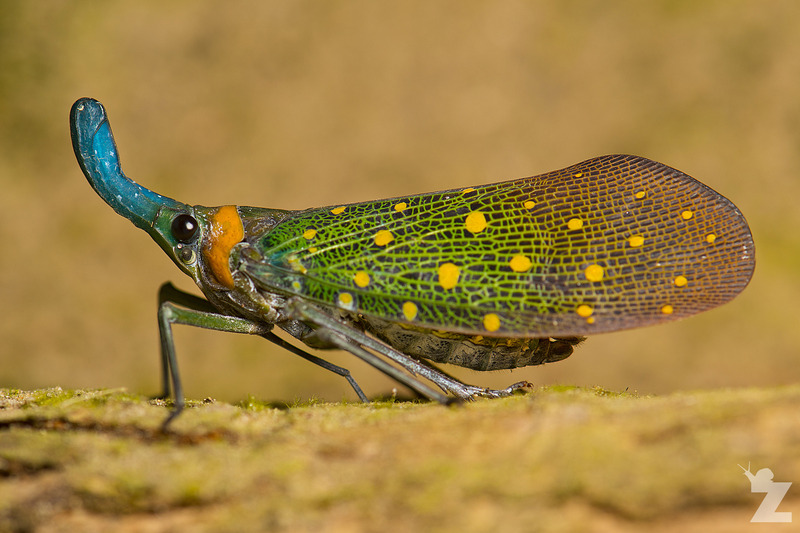 What a fabulous and interesting bug, and trully wonderful photographs! That guy is a real eye-catcher! Stunning pictures!